A closeup of the Heceta Head Light tower. 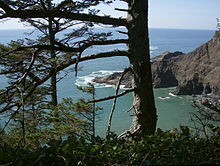 Looking north from Cape Sebastian. 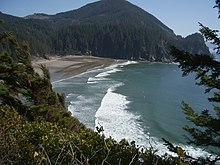 This is a list of state parks and other facilities managed by the State Parks and Recreation Department of the U.S. state of Oregon. The variety of locales and amenities of the parks reflect the diverse geography of Oregon, including beaches, forests, lakes, rock pinnacles, and deserts. The state parks offer many outdoor recreation opportunities, such as overnight camping facilities, day hiking, fishing, boating, historic sites, and scenic rest stops and viewpoints. Oregon Parks & Heritage Guide 2008. October 2007. Oregon Parks and Recreation Department. ^ Year round is the Oregon Parks and Recreation Department designation for the site; it probably reflects whether maintenance is performed. The site may be accessible and of interest even when closed. ^ All state campgrounds have tent sites; yurts, cabins, tepees, and RV sites are available at some. 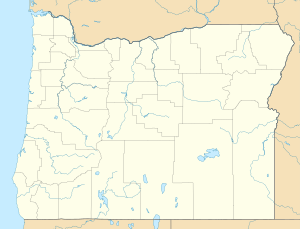 ^ This is the nearest incorporated city referenced in the Oregon Parks and Recreation Department website driving directions (though the site may actually be in another, unincorporated, community) except for the gorge locations where the OSPRD website is inconsistent. For those, the nearest incorporated city or Multnomah Falls is used as a reference. Oregon Secretary of State (January 13, 2012). "Oregon Administrative Rules contain OARs filed through January 13, 2012". Retrieved 2012-02-18. This page was last edited on 16 December 2018, at 06:07 (UTC).